The successful arrangement of B&B Rinaldi on Vasilevskiy offer travelers arrived in St. Petersburg to feel the beauty of the "Venice of the North" and personally witness the spectacular ensemble of the Spit of Vasilievskiy Island. Behind the exterior of a XIX century landmark and within easy reach of the Pulkovo airport lies our confortable mini-hotel, a haven of peace and quiet on one of the busiest avenues of Saint-Petersburg - Moskovsky prospect. Each of the fourteen rooms is fully furnished with everything you may need during your stay, including toiletries, a television set, a safe and complimentary free wi-fi. 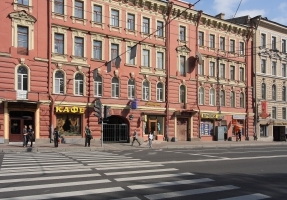 B&B & Rinaldi Poetic is just a 2-minute walk from Nevsky Prospekt, a 5-minute walk from Moscowskiy railway station and subway stations Ploshchad Vosstaniya and Mayakovskaya. Near the hotel are many attractions, theaters, restaurants and shopping centers.